Summer is all about travel and no matter how hard I try to not pack too many items in my suitcase, packing my beauty essentials is something that's non-negotiable for me. Even when I'm on the road, or on vacation, I always pack my Crest 3D whitening strips and toothpaste. Having a white smile is always important to me—even while on vacation or when I'm travelling. This summer it's all about the 2016 Rio Olympic Games, and I love that Canadian athlete Brianne Theisen-Eaton is sponsored by Crest—the only toothpaste I use! Brianne knows a thing or two about travelling and being on the road all the time. 2. Check the expiration date on your passport—make sure you've got enough time to get you passports renewed! 3. Take your time when packing—this is sometimes hard, and complicated, but if you're a careful packer, you'll take up less room room in your suitcase, you won't forget the items you need, and you can even try to talk yourself out of packing yet another pair of shoes you will likely not wear. 4. Keep the basics in a carry-on. If your suitcase gets lost and you have to wait a day or two to get it, make sure you've got a change of clothes in your carry-on and the essentials, like Crest White Brilliance 2 Step Toothpaste, since the tubes are under 100 ml each. 5. Eat healthy! This is not always easy when travelling through airports, so pack your own snacks to avoid the temptation of eating badly, which can make you feel groggy. 6. Plan some downtime. While you're relaxing in your hotel and charging you phone, you can even use Crest 3D Whitestrips to give you an even whiter smile for those pictures. These great tips will help you #SmileThrough it all. Another thing to make you smile? 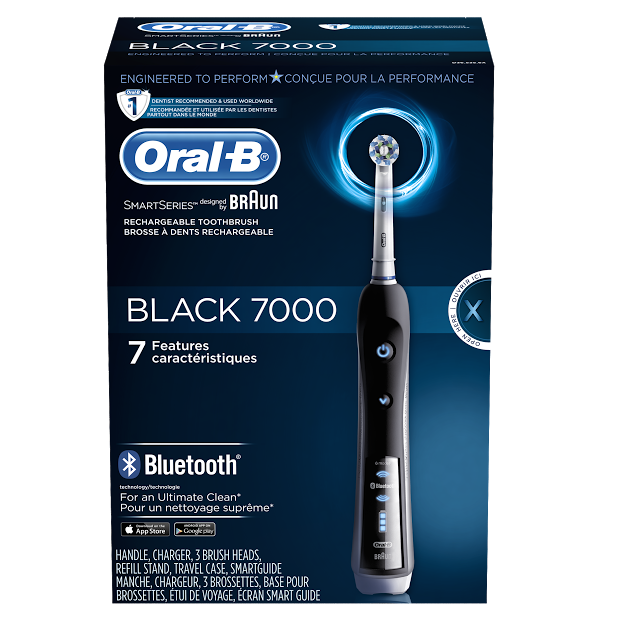 I'm giving away a $50 VISA gift card so you can buy your travel essentials and an Oral-B Black 7000 SmartSeries Electric Toothbrush! This toothbrush is no ordinary toothbrush; it's worth $239.99, and is available at select retailers across Canada. Used together with Crest 3D White toothpaste, you're guaranteed a perfect smile and healthy, sparkling teeth. It works in tandem with a mobile tracking app, delivering real time guidance and records your teeth brushing activities to provide personalized oral health data. The power brush has a built-in timer to ensure that you brush for the dentist recommended two minutes and notifies you once complete. The app also provides news updates to keep you busy while you brush, and it signals and decelerates speed when the user is brushing too hard. It removes up to 100% more plaque than a regular toothbrush. It stores your date, helps you stay informed, and helps you become a better brusher. Anything I can do to avoid multiple visits to the dentist—I'm a big fan of! To win, just leave me a comment below telling me what your travel essentials are. I'll pick a winner randomly on July 10th. P&G is participating in this giveaway only as a prize supplier and is hereby released from any and all liability which may occur through the promotion, administration, and execution of the contest. This contest is officially sponsored by Loulou's Views. Disclaimer: I have been compensated by Crest, and all views and opinions are my own. My travel essentials include Crest and my toothbrush. The one thing I simply must travel with is a personal lighted magnify mirror for makeup application. It's always so dark in hotel rooms! I always travel with my OralB toothbrush except my battery is on it's last legs so winning this would be perfect timing! Once you use an electric toothbrush, you never go back! My Travel Essentials include tooth brush, toothpaste, moisturizer, sunscreen and lip gloss. My travel essentials are lip balm, my moisturizer, sunscreen and a toothbrush and toothpaste! My travel essentials are my small refillable bottles so I can take all my skincare products In my carry on bag, I try not to take a large case while travelling as it is so much easier! My travel essentials are my small refillable bottles so I can take all my toiletries in my carryon bag, I hate taking a large suitcase! My travel essentials are deodorant, make-up, flip flops and a swimsuit. My travel essentials are sunscreen, chapstick, waterproof sunscreen and sunglasses! My travel essentials are comfortable clothing and shoes, my make-up (foundation, powder and lipgloss), camera and cell phone. My travel essentials are lip balm and makeup remover wipes. My travel essentials are sunscreen and toothbrush. Crest is my favourite toothpaste and I never leave home without it. A toothbrush and some dental floss and I am good to go. Toothbrush, hairbrush, makeup wipes, deodorant...lots of essentials! toothbrush, hairbrush, makeup remover wipes, deodorant, lots of travel essentials! My travel essentials are my hat, sunglasses, and sunscreen or and an easy to carry water bottle. I do not do well with heat/sun without those things! My travel essentials include toothpaste for sensitive teeth, toothbrush, deodorant and sleepwear, once I forgot the sleepwear so it is always in my travel bag now! My travel essentials are baby wipes to clean my hands and tooth paste and brush to keep my teeth clean. My travel essentials are toothbrush and toothpaste, hair brush, deodorant, soap, shampoo, and makeup basics like powder, mascara and lip gloss. My travel essentials include my toothbrush, sample sized paste and a versatile, but small wardrobe :) I love a good roadtrip; dont forget SNACKS! My travel essentials makeup, teeth whitening, deodorant, sunscreen, etc. So many essentials! My travel essentials are a good quality shampoo and conditioner. I like when my hair behaves when I'm travelling. My travel essentials are toothbrush and paste, comfortable shoes, my curling iron, face wash and body wash.
a toothbrush and toothpaste are right at the top of the list. Deodorant is very important. Also extra clothes and my cellphone. When I travel I need a toothbrush and toothpast. I will not talk to people till I brush. Aside from the obvious (passport, money, toothbrush & toothpaste, makeup), I always make sure I have slippers or flip flops (for hotel room), and earplugs (hotel airconditioners can be loud). My travel essentials are cash, comfortable shoes and my blow dryer from home...those hotel blow dryers are horrible! My travel essentials are a tooth brush, tooth paste, body wash, shampoo, a fresh change of clothes and a camera! I'm good to go with all that! My travel essentials include a face spray, cleanser, a tinted moisturizer. and hand sanitizer! - Toothbrush, toothpaste, mouthwash & floss. My travel essential is my travel pillow. Great for getting comfy on long flights. My travel essentials are my crest toothpaste and mouthwash as well as my SPF 80 sunscreen. My travel essentials are my sunscreen and flip flops. Of course, those are also my summer essentials. My travel essentials are a coordinated wardrobe of black and white, a few colourful scarves and a pair of stylish walking shoes. My travel essentials are toothbrush, makeup, hair supplies and camera! My travel essentials include a multi plug power bar with USB ports, portable battery packs, a folding tote bag like envirosax. I would love to add an Oral B Balck Smart Series Toothbrush to that list. My travel essentials include my toothbrush, toothpaste, lip balm, and teeth whitening strips! My travel essentials are antibacterial wipes, toothbrush, hairbrush and a sense of adventure! The one thing I cannot leave home without when traveling with kids is Pampers wipes! They are a sponge bath on the road, and they are hot water and soap when you don't have any. They are toilet paper when you're on the side of the road and they can be used as a toothbrush if during a long road trip a fur coat happens on your pearly whites. They also work as a surface cleaner for the dash when and accumulation of dust bunnies take over. All and all baby wipes are a must have even without the baby. Thanks for hosting a fab giveaway! I know we could use a Oral-B toothbrush with so many pearly whites to keep clean. My travel essentials are lip balm, moisturizer, toothbrush and paste, phone and blister pads. My travel essentials are toothbrush, toothpaste, deodorant, hand sanitizer, sun screen and moisturizer. I don't leave home without my passport, tablet preloaded with destination maps, my most comfortable shoes, and depending on the destination, a change of clothes for the best possible and worst possible weather. Everything else can be purchased when I get there! Definitely a toothbrush, brush and hair tie, camera, comfy shoes and sunscreen. My travel essentials are passport, camera, toothbrush and paste, makeup, comfy shoes, a book or two depending in the length of stay. My travel essential is a portable charger for my phone and tablet! My travel essentials are camera, toothbrush, mascara, my Kobo and hairbrush. My travel essentials are of course a toothbrush/paste, mascara, allergy meds, camera, phone, passport, bathing suit, and a good attitude! My travel essentials include my floss, my toothbrush and toothpaste, a nail file, sunscreen, and a book! My travel essentials include floss, my toothbrush and toothpaste, a nail file, sunscreen and a book! My travel essentials are sunglasses, sunblock, toothbrush and toothpaste and lip balm. My travel essentials include cell and charger, credit and debit cards, cash, toothbrush, toothpaste, hair brush, deodorant, soap, shampoo, conditioner, makeup, sleepwear and clothes for the occasion.